The spring brings many changes to ten-year-old Ariel's life. The prospect of a new baby in the house leaves her feeling strange and left out. But Grandma knows how to make Ariel feel a part of things. Together, secretly, they will make a beautiful quilt as a special gift for the baby. Then Grandma suffers a stroke, and Ariel is left lost and afraid. Determined to complete their gift, Ariel struggles to piece the quilt together. But will that inspire her grandmother to get better and share in her efforts? Little does Ariel know her grandmother has a secret gift planned just for her, a gift that will wrap Ariel in the warmth and love of family. "I grew up on a dairy farm in a region known as Vermont's Northeast Kingdom, along with one sister and three brothers in an area our Scottish ancestors settled almost two hundred years ago. "Since graduating from Johnson State College Vermont with majors in both art and athletic training, I have worked as a coach, trainer, energy auditor for the Extension Service, and mostrecently as Elderhostel Director and cross-country ski instructor at the Craftsbury Sports Center before turning to writing full-time. "I have many passions. I am an athlete, naturalist, artist, and a writer, and all of the things I do are rooted in the Northeast Kingdom. I run five to ten miles each morning, cross-country ski, mountain bike, swim, and play tennis. I also played field hockey all across the country for many years. I love the outdoors, and study and sketch birds and wildflowers which are most often the subjects of my watercolor paintings. For the past seven years, my husband, Tom, and I have beenbuilding a timber-frame house. We both enjoy working with wood, and Tom shares my love of the land, sports and animals: we have a Morgan horse, five dogs, and eight cats. We lovegardening and have planted an orchard of old apple varieties. And I love histories and walking old cemeteries. 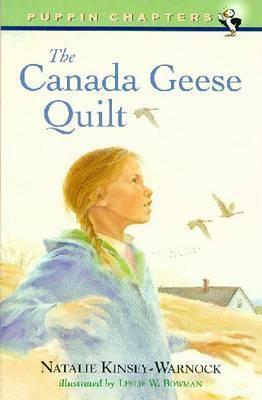 "My first children's book, The Canada Geese Quilt, grew out of my love andadmiration for my grandmother, Helen Urie Rowell, and a special quilt the two of us made together. My grandmother began quilting when she was in her sixties, and over the next fifteen years she made over 230 quilts. I designed about twenty of them. Most of them are of birds, wildflowers and starry skies, but one is of Canada geese -- and that inspired the book. "My husband and I live in Albany, Vermont, where I am always at work on new books." copyright (c) 2000 by Penguin Putnam Books for Young Readers. All rights reserved.